Two birds one stone: Most guys never think about coasters; Guys don't want to spend $25 on coasters. Solution, make these badass water ring barriers for less than $10 and 15 minutes of work. It’s New Year’s Eve, our friends are over, and everyone is having a great time. My wife and the other ladies in attendance are flocked around the latest one in our group to become pregnant, while I’m in the living room with the guys. The drinks are flowing and we’re on our third round of Cards Against Humanity. What could ruin this fun filled evening? A ring on our new coffee table, that’s what. This is where coasters come in. Coasters in and of themselves are not really manly things. They are however, a necessity for the upscale and mature Primer reader. In the same way that the subtlety of a well-matched suit and tie combo says “I’m a professional,” a young man’s apartment with coasters says “I’m an adult”. 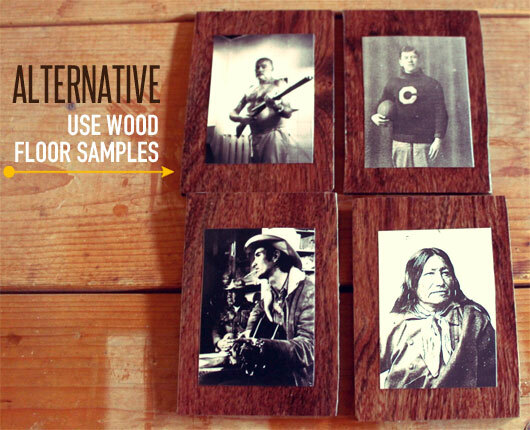 Coasters are an accessory to your living environment and should complement your specific style. 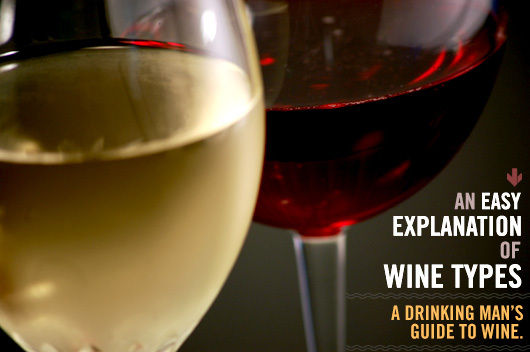 You could search specialty decorum shops and the internet for coasters that may fit your specific style and, if you find some, they could easily cost $20 or more. Why not get some that exactly match your style and create an interesting conversation piece at the same time? This is easier to accomplish than you might think, and cheaper too. Remember the article on cheap manly art? We’ll be using the same concepts here. You need to decide what manly pictures you want on your coasters. I made several sets while trying out this process. On one set, I used diagrams form an old Chilton’s small engine repair guide. On another, I used the Ernest Hemmingway and Townes Van Zandt prints from the cheap art article (Big thanks Primer reader Colby for that image). Another good source of unique pictures is the National Archives photo website. Cut your pictures out of the book or print them out on normal copy paper. Photo paper is thicker and will require more coats to even everything out. 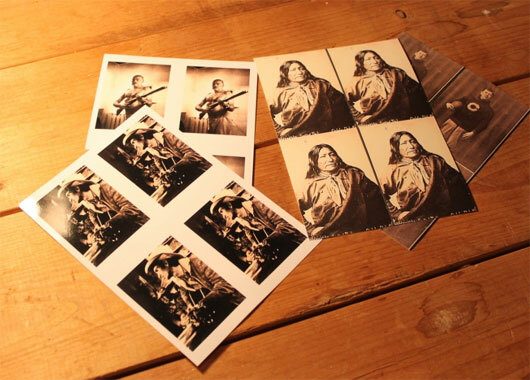 Your coasters are going to be 4”x4” so make sure your pictures are smaller than that. I like 3”x3” or smaller because it creates a frame like look around the picture. Take all your supplies to your workshop or balcony. 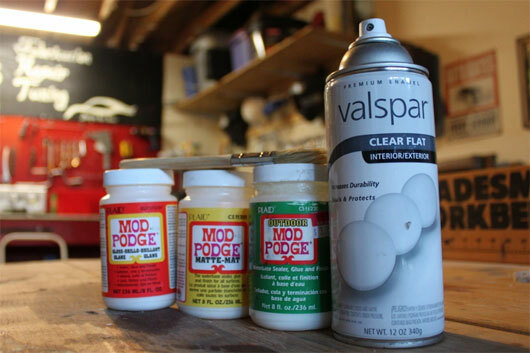 You’ll want to do this somewhere with ventilation because the sealant and Mod Podge stink. Stinky usually means toxic, and toxic means bad. Give each of your tiles a coat of Mod Podge . While it’s wet, center a picture on the tile and smooth it down with your fingers. Try to get out any air bubbles that may be under your picture. Let it dry for 4 or 5 minutes and give it another coat. Once this coat dries, do 3 or 4 more light coats. This is where your heat gun or hair dryer comes in. You can use it to speed up the drying time between coats from 20 minutes to about 2 minutes. You can do all the tiles at once or one at a time, whatever you’re comfortable with. 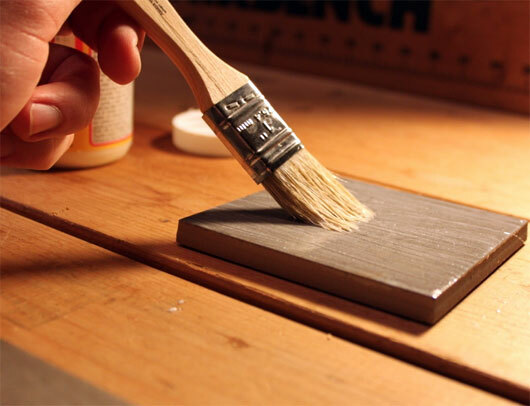 Seal the tile with the spray on clear coat. Follow the directions on the can, and keep the coats very light. You’ll want to do 2 or 3 coats of clear. This step really stinks, so you should do it outside if at all possible. I’ve found that letting them cure in the sun for a few hours makes the smell dissipate quicker. The final step is to cut your felt and glue it to the bottom of each tile. 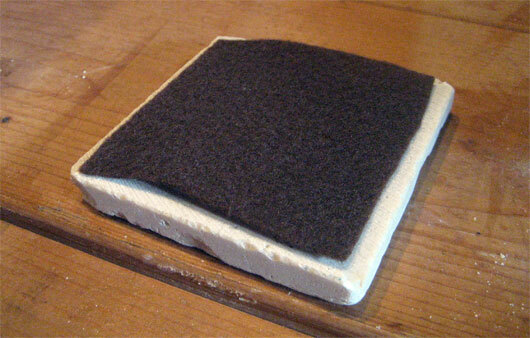 Cut your felt to be about a ½” smaller than your tile. You don’t want it poking out from the sides. Most tiles have a grid pattern on the bottom. Run a small bead of glue along all the lines of the grid and press down the felt. Once the felt is pressed on, let the glue dry. Your custom made, manly coasters are ready to roll. All in all, including drying time between coats, the project should take you a whole day, maybe two if the clear coat takes a while to dry. Actual work time is only about 15 minutes. Your total cost will vary depending on the tiles you buy, but mine came in at a about $10, and I have plenty of Mod Podge and clear coat left to make more sets for gifts. I mentioned that I did several runs to get the process right. Instead of tiles, you can use vinyl “wood” flooring samples. They cost about $0.26 each, they’re easy to trim to the right size, and they have a rubber layer on the bottom. I used cherry finish because I liked the darker look, but walnut is good too. Just cut your “wood” with the scissors, and follow steps 2 and 3. They don’t look as good as the tiles ones, but they would be perfect for a game room or if you needed several sets for parties. Very cool, endless possibilities. Other options: Newspaper clippings, those dvd booklets you never look at from your collection, maybe even old baseball cards (though probably too thick). Thanks Adam! Those are great ideas Ryan. You’re right about the baseball cards being too thick though. They’ll work, but there would be a noticeable edge around them. I have done a couple larger projects since writing this. I took old b&w car ads and laid them on this sheets of plywood. I mod-podged them and hung them on my wall in the garage. You could do them same thing in a man cave with car ads, beer ads, old comic book covers, whatever! Is clearcoat a durable enough topcoat? I imagine it’s just as susceptible to eventual water damage as the clearcoat on your coffee table. If you wanted to get really fancy you could put a strip of cardboard around the edge as a frame to pour on a layer of epoxy, then buff it to a glass finish. I haven’t had any issue with the clearcoat so far. I have one of the coasters at my desk and I use it every day. I also use this clearcoat on parts of my Jeep that have been repainted. They sit in the sun, rain, mud, and salt spray and are holding up well to. The trick is to use light coats…really light, and let them dry between each coat. I’m sure eventually the finish will begin to deteriorate, but by that time your style will probably have changed and you can just make a new set. Cool idea with the epoxy resin though, you should give it a run and post some pics! Awesome project, Adam! I’m glad y’all liked the Townes photo. So after the initial layer of modge podge you use to stick the picture on, you put a couple more layers on top of the picture? You got it. It helps protect the picture and levels everything out. Could shrink some of the posters down or use them for non coaster applications. Man I love stuff like this. Was wondering how many more cheap art ideas you or anyone else has. 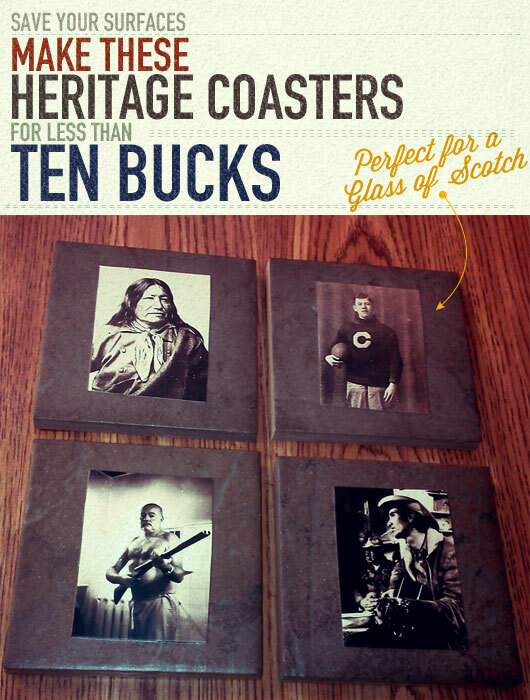 If you scale down the 8×10 prints, these make some awesome coasters. And make an inexpensive gift for friends!